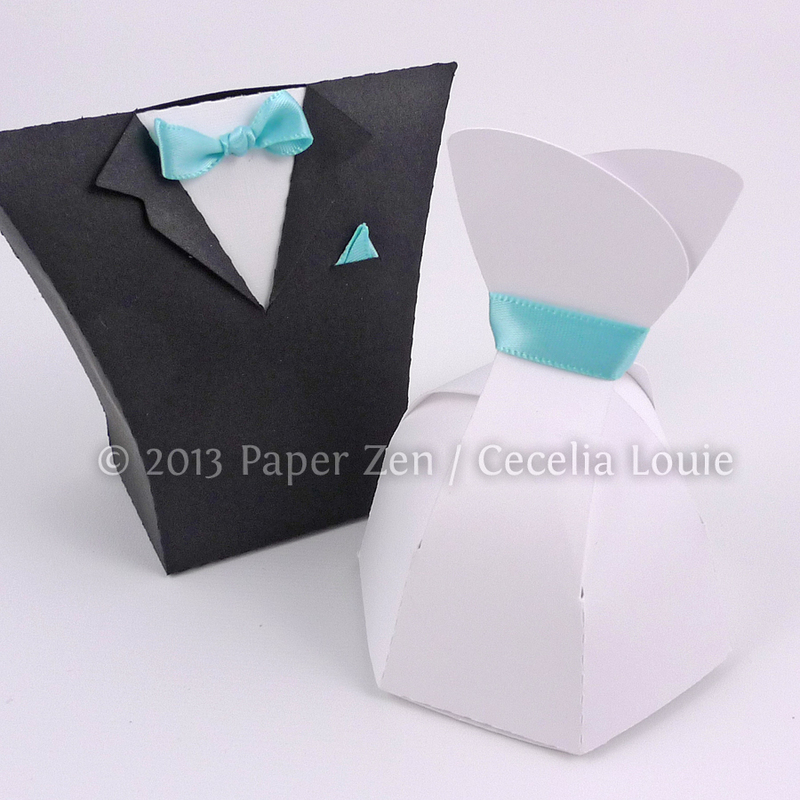 Please follow my new blog, Paper Zen for my latest projects and tutorials! 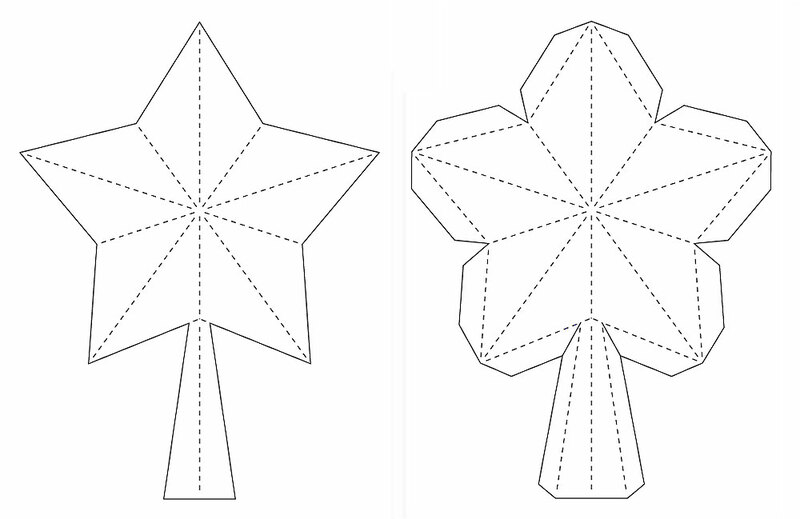 Please follow my new blog, Paper Zen, to see my new die cut patterns! 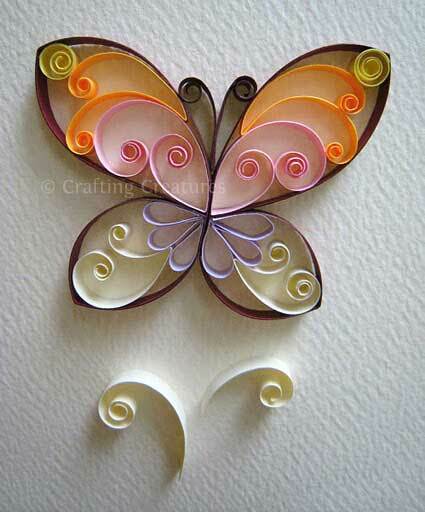 Please follow my new blog, Paper Zen, to see my latest quilling and die cutting paths. 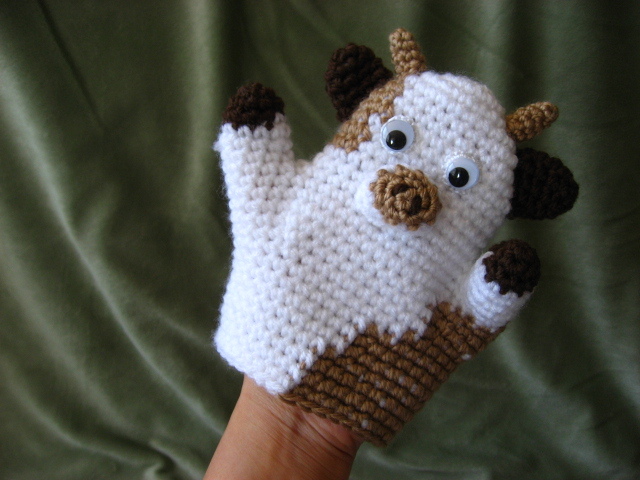 Dear Crafting Creatures readers, I want to say thank you! 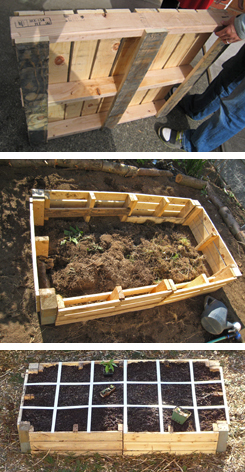 I started this blog years ago with my friends to inspire each other with our projects. I’ve been the only one adding to it for some time, and the name Crafting Creatures doesn’t suit my new direction. I will continue blogging in my spare time, but now it means more to me than a hobby. I’m taking my paper on new paths and I really hope you’ll follow me there, as I will not be updating this blog anymore. My new blog is Paper Zen, which describes both how tranquil I feel when working with paper, and the enlightenment I hope my work gives others. 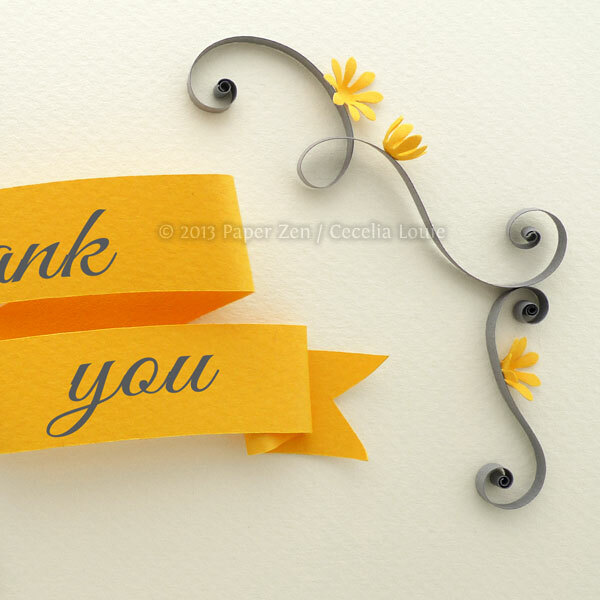 I’m indebted to you, kind reader, for giving me wonderfully encouraging words to keep going. 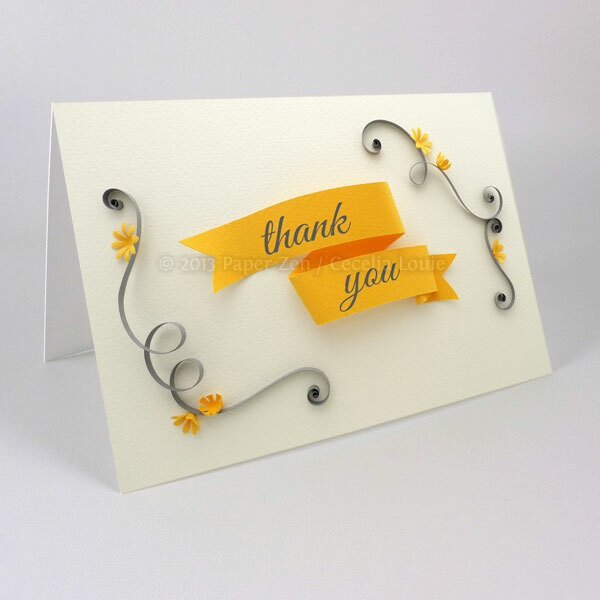 To return your enthusiasm, I’d like to give you my quilled Thank You card and matching envelope. 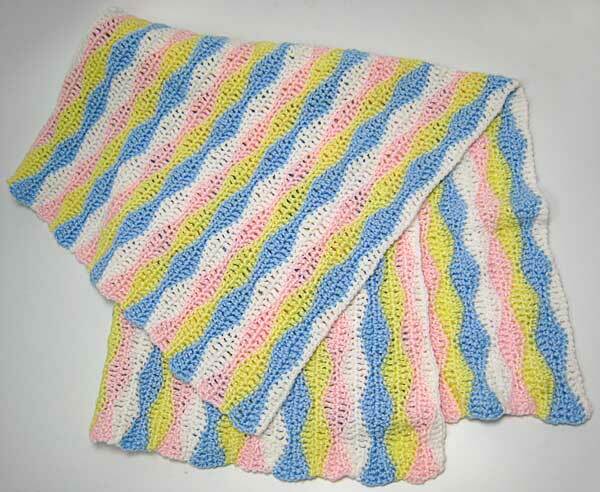 It’ll be for sale in my Etsy shop afterwards, so grab it now by visiting Paper Zen! Although I’m more of a tomboy than a girly-girl, I did save every wedding party favor as a little girl, dreaming of the day I would marry my sweetheart. 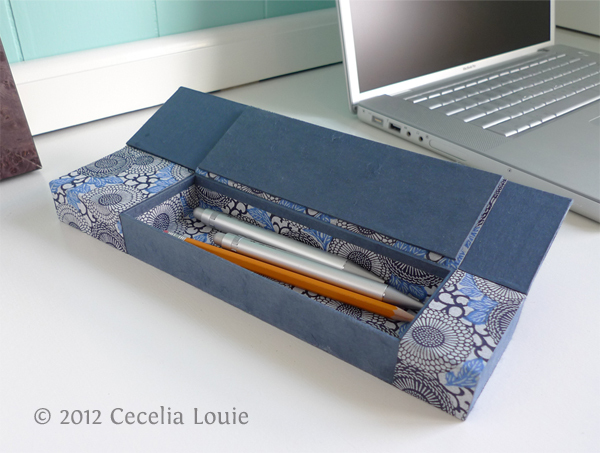 I don’t know why I have such a thing for boxes, but I do love how it’s hiding a small surprise. 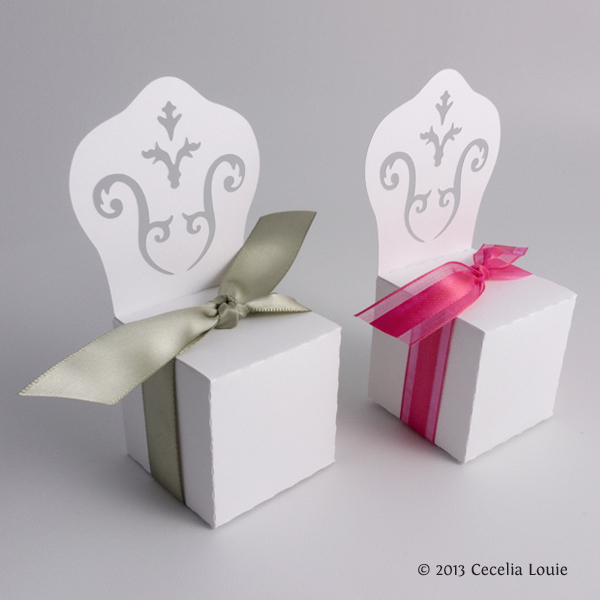 The ones I love most serve double purpose, whether to be decorative or in this case, to show a guest to their seat. 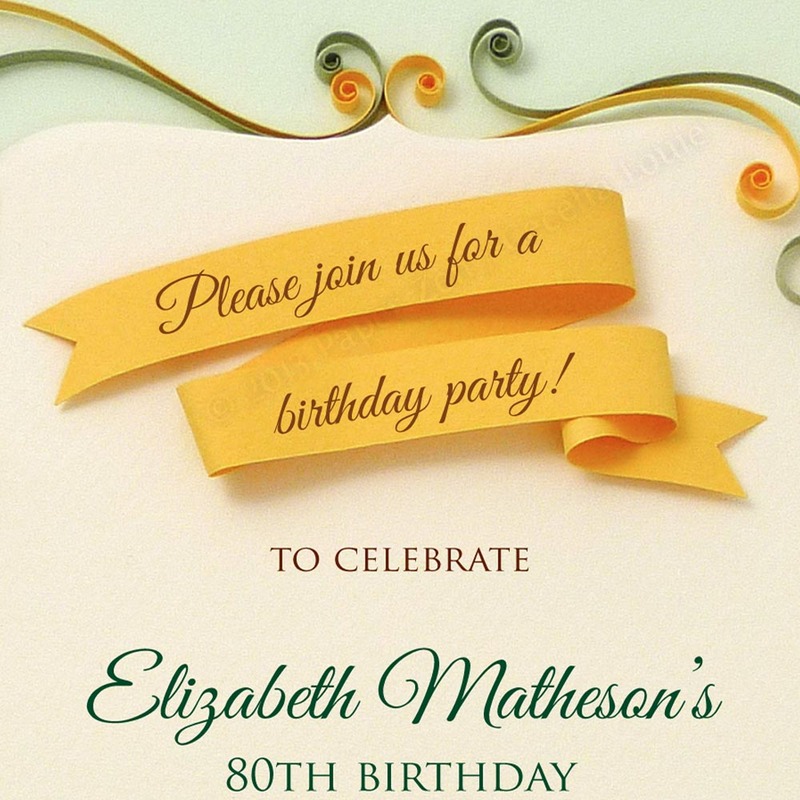 I used a heavyweight vellum which allows the damask pattern to be seen yet not obstruct the guest’s name. 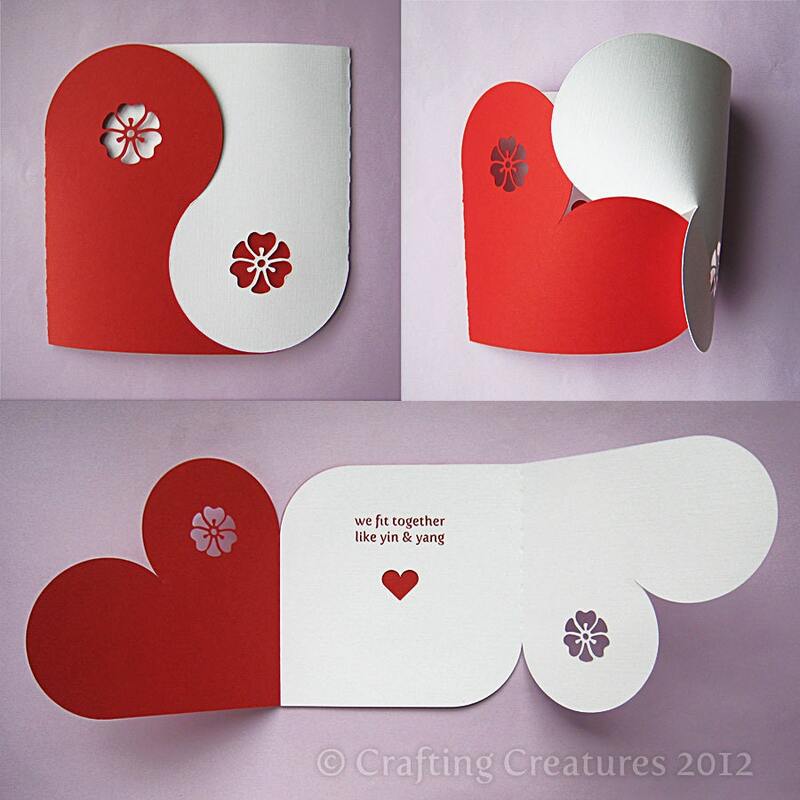 A square tag is glued to the front, with a couple’s special day and message. The 1.75″ cube has a chair backing that is 4.25″ tall. 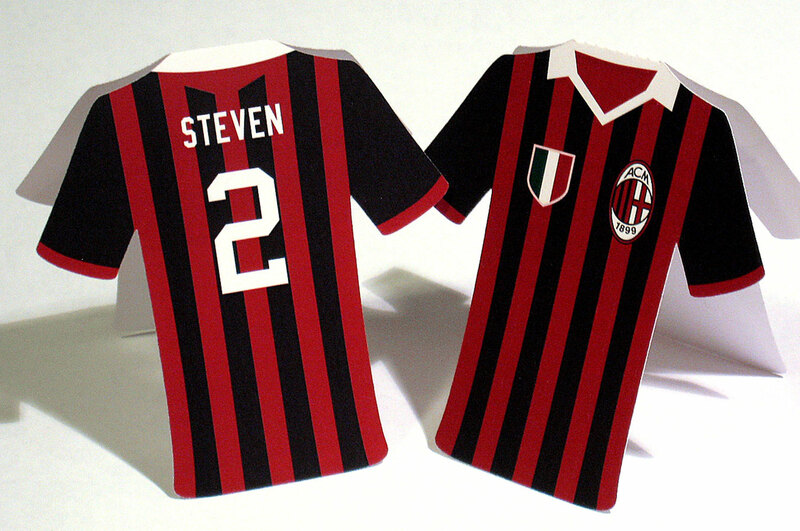 Two boxes can be cut from a single sheet of 11 x 8.5″ paper. In this example I’ve used Silver Stardream cardstock. The font used here is Great Vibes. 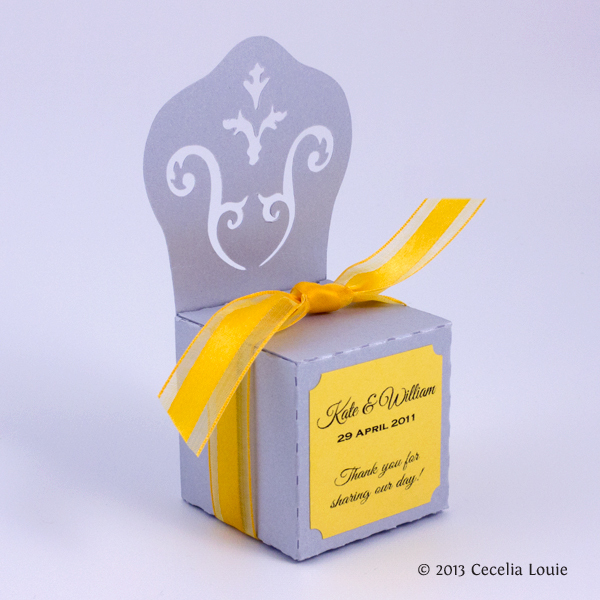 Damask patterns have always been used in classic decor in such a broad range, and I struggled for quite some time to have the design be strong enough to hold the name tag. I also think it looks just as complete without the name tag, so it’s perfect for occasions other than weddings. 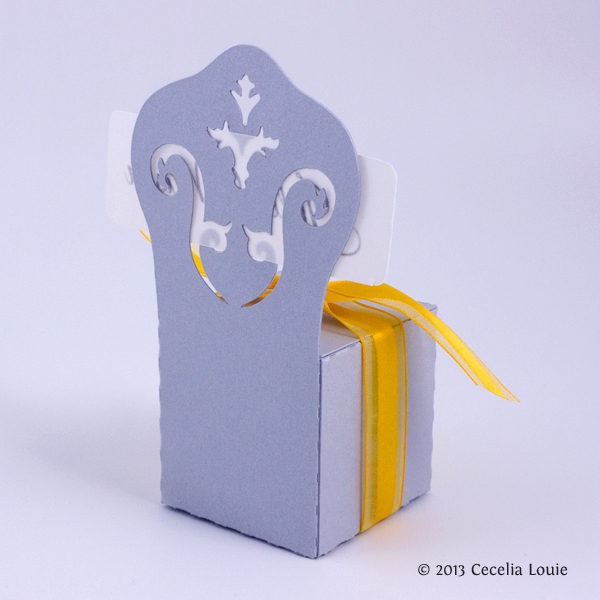 My Damask Chair Box is now available in my Etsy store for instant download. I’ve saved the files in SVG, DXF, MTC, and PDF formats. Thanks so much for your kind comments! I shot a video of opening the Mystery Box, (All Things Paper book by Ann Martin) and the publisher, Tuttle, has now got it live on their site. Click the “Product Video” tab to see how it works! My dad wears a ratty, tattered vest and even though I’ve given him new ones, he still keeps wearing the old one anyway. 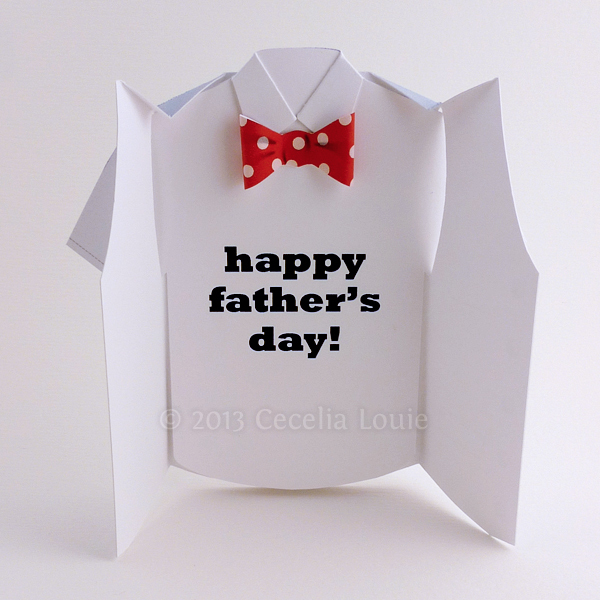 He doesn’t wear a bow tie, but I think he’ll get a kick out of this card anyway. 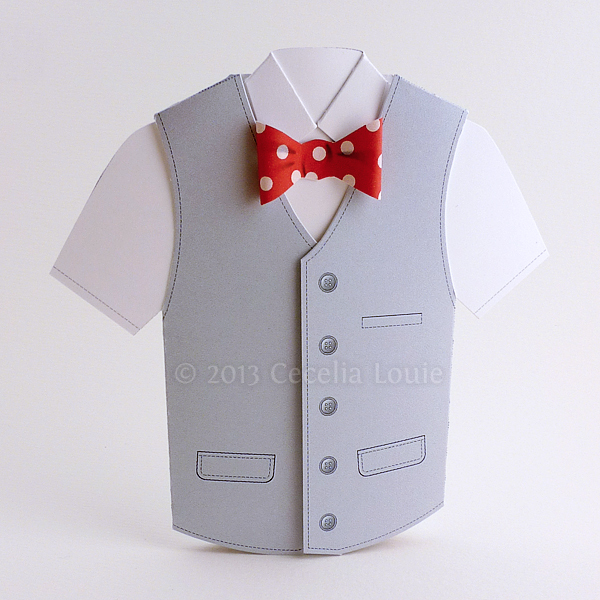 I’ve been experimenting in the realm of “printables” and this is made of 3 pieces – the bow tie, shirt, and vest, cut from 1 sheet of letter-size paper on 80lb cover stock. It was fun to shade the bow tie and give it a sense of 3D while really giving a 3D shape. 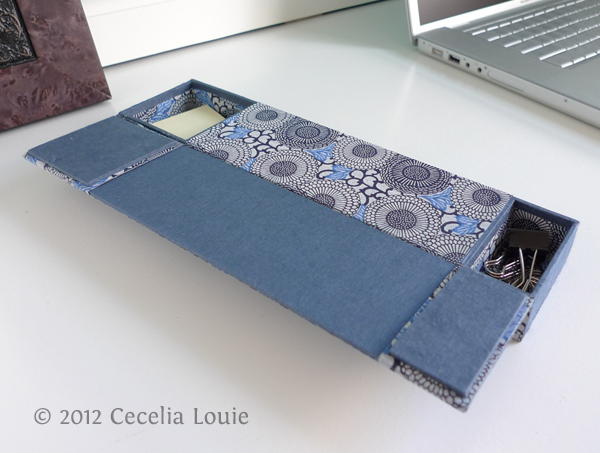 Details in the buttons and stitching was a cinch to print. 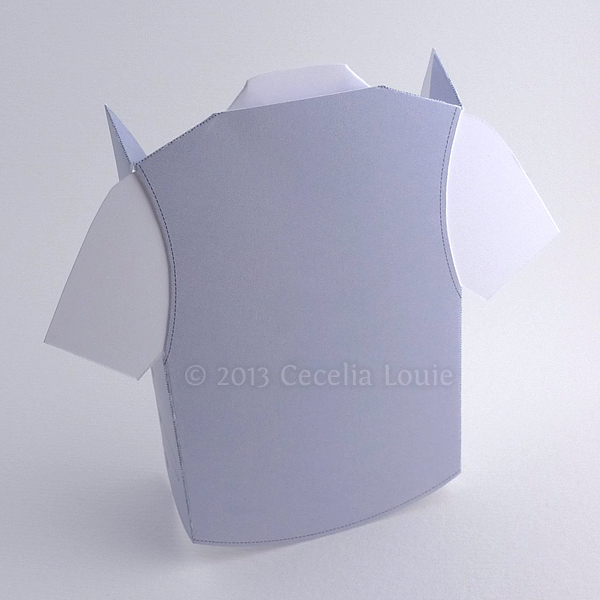 It helps keep the vest flaps down when the card is closed. I’ve written my message under the shirt, which is removable. 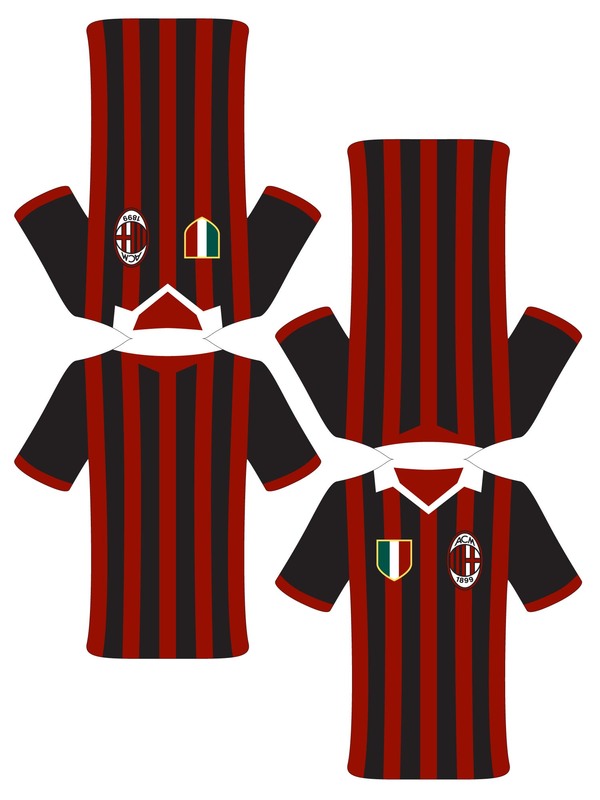 Somehow I quite like the back as well simply for its minimalism. He’s a man of little words, so I’ll see what kind of reaction I get during tonight’s dinner. 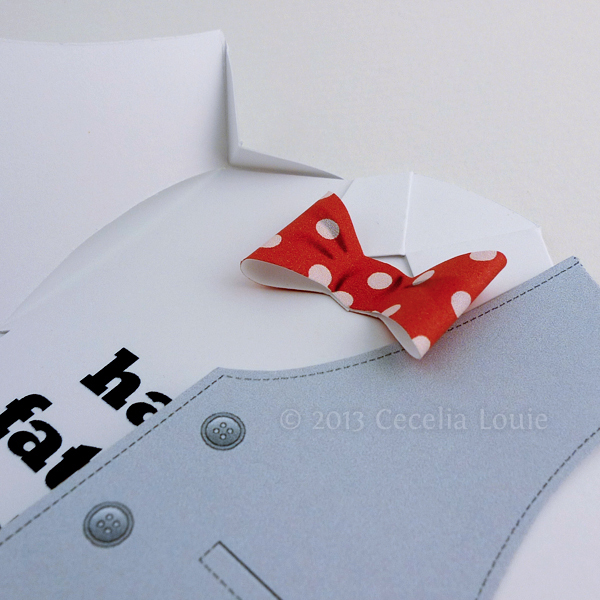 If you’d like to cut this card by hand, I’m selling a “printable” and “cuttable” file on Etsy.